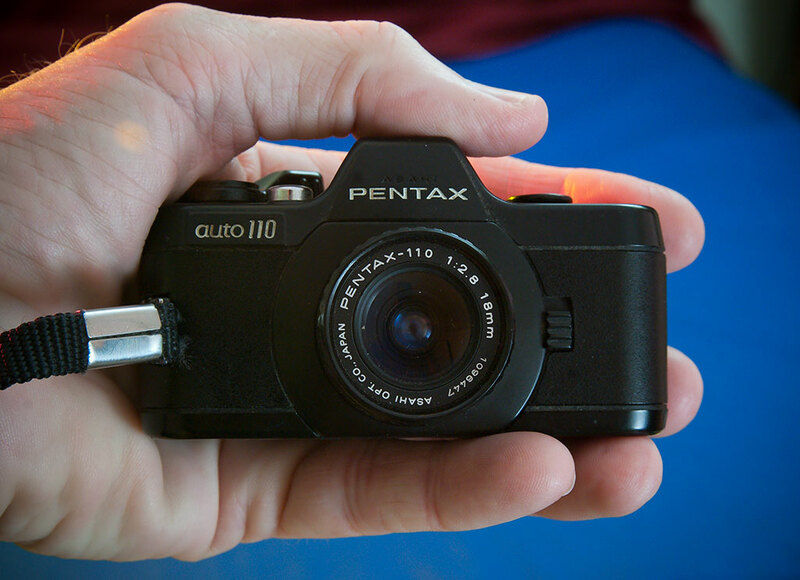 The Pentax Auto 110 sits in my hand, illustrating just how small this SLR camera really is. 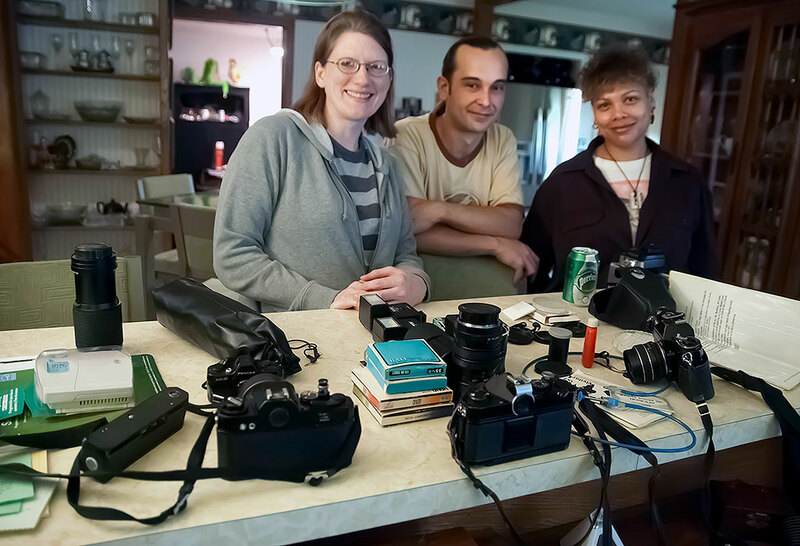 Jamie and her husband Ian, along with a friend of theirs, pose with some of their collected cameras, including the Pentax Auto 110, in 2012. Five years ago, one of my best friends, Jamie, received an unusual gift, a Pentax Auto 110 SLR (Single Lens Reflex) film camera, and brought it to me to size it up. To say that this camera is “rare” is a double-edged sword: from my perspective, this camera is rare enough that Jamie’s is the only one I have ever seen. However, with Buy It Now prices on eBay hovering between $40 and $150, it’s obvious that quite a few were manufactured. My guess about this combination is that many cameras were sold and few were actually used to make pictures. Photographers who remember the 1970s recall that the 110 film cartridge was one of Kodak’s efforts to reinvent film. 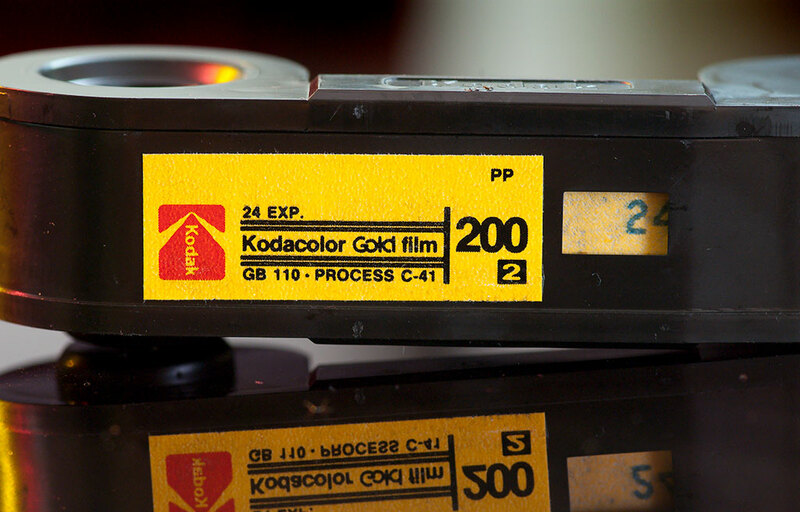 Supposedly responding to a perception that roll film was difficult to load and manage, Kodak brought out the 110 cartridge in 1972. 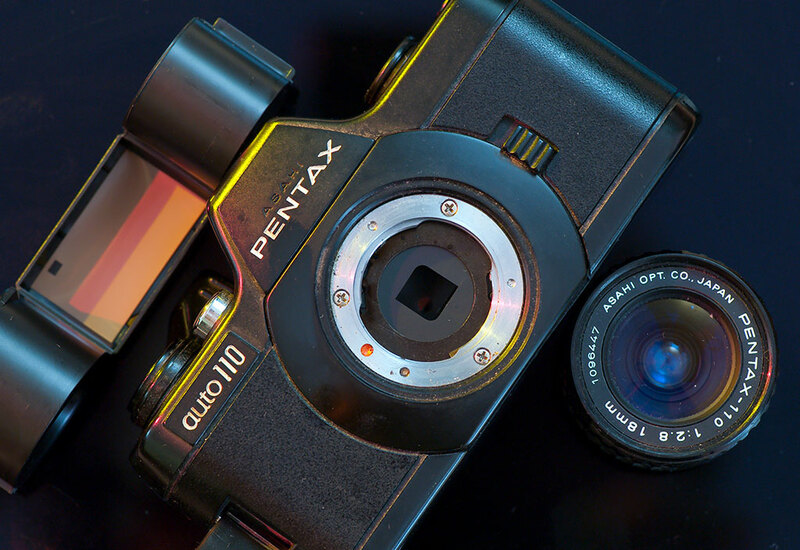 The Pentax Auto 110 was a neat-looking little camera, show here with its lens and film removed. 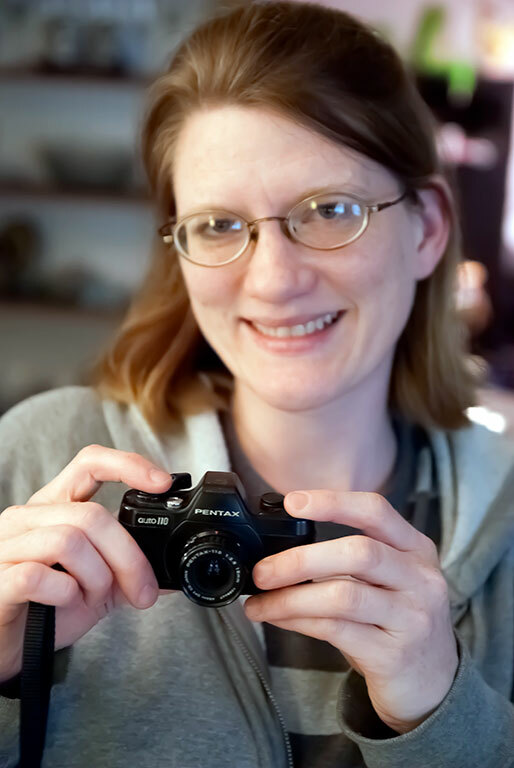 Jamie holds her Pentax Auto 110 five years ago. She lent it to me this week to photograph. Almost all of the cameras made for 110 were slim point-and-shoot cameras with fixed focus and exposure, relying on negative film’s latitude for exposure control. Many of them used flash cubes, which would fill a room with blinding light. 110 film frames are officially half the size of 35mm frames, so with the state of film in the 1970s, it was difficult to get decently detailed images with such a small film area, which is why 110 remained an amateur format. 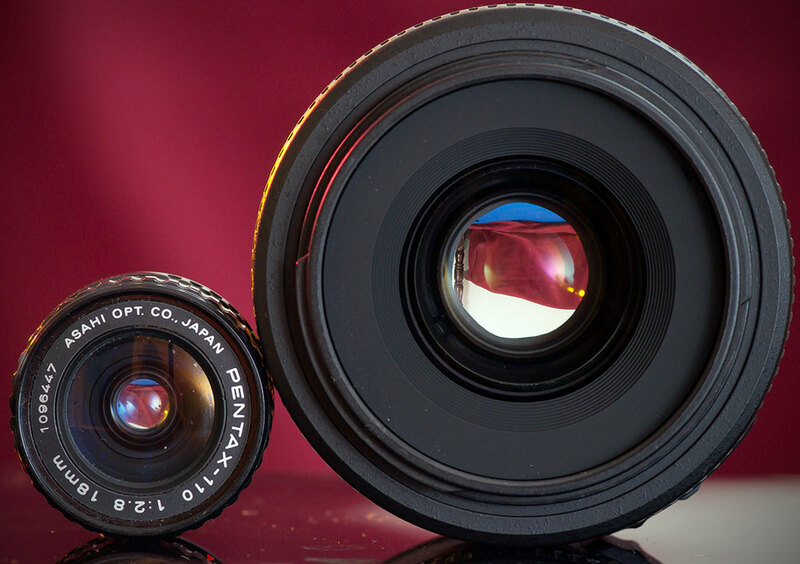 The Pentax 18mm f/2.8 for the Auto 110 sits next to the AF-S Nikkor 35mm f/1.8, roughly its latter-day digital equivalent. Though the 18mm was sold as a wide angle, it really isn’t very wide. 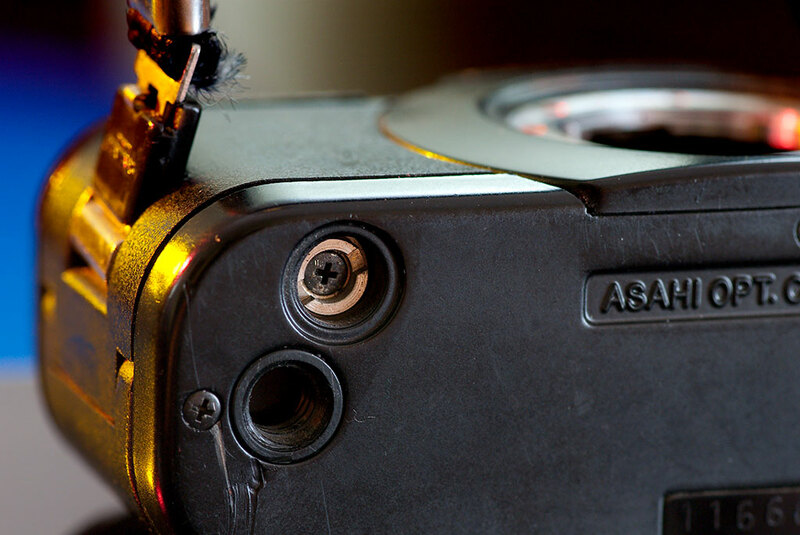 Believe it or not, this tiny camera could be fitted with an auto winder, using the fitting shown here on the bottom of the camera. The camera is so miniature that it feels like a toy in my longish hands. The viewfinder is large and clear, with a split-image focus aid in the center. The lens mounts in the same direction as most SLRs (lefty loosey righty tighty), and focuses in the same direction as my Nikon lenses. Focus is smooth, but the focus throw is a little long. Exposure is set entirely by the camera (Program mode), with ISO being set by the film cassette. That’s a shame, since the driving force of a great camera is allowing the photographer to run the show. The Auto 110 has no manual exposure mode, and doesn’t even have exposure compensation. Despite the issue of lower image quality due to small film area, the 110 cartridge was not without its charms. It required no feeding into a slot, and didn’t require rewinding. Also, if you took the cassette out of the camera in the middle of the roll, it would only expose (and ruin) one frame, the rest of the film protected by the cassette. I know we owe a lot to Pentax, particularly for the K1000 and its role in teaching a generation of broke college students how to run an all-manual film camera, but the Auto 110, despite its innovation, came at the wrong time in history and with the wrong feature set. Still, it’s neat for Jamie to have it in her collection. 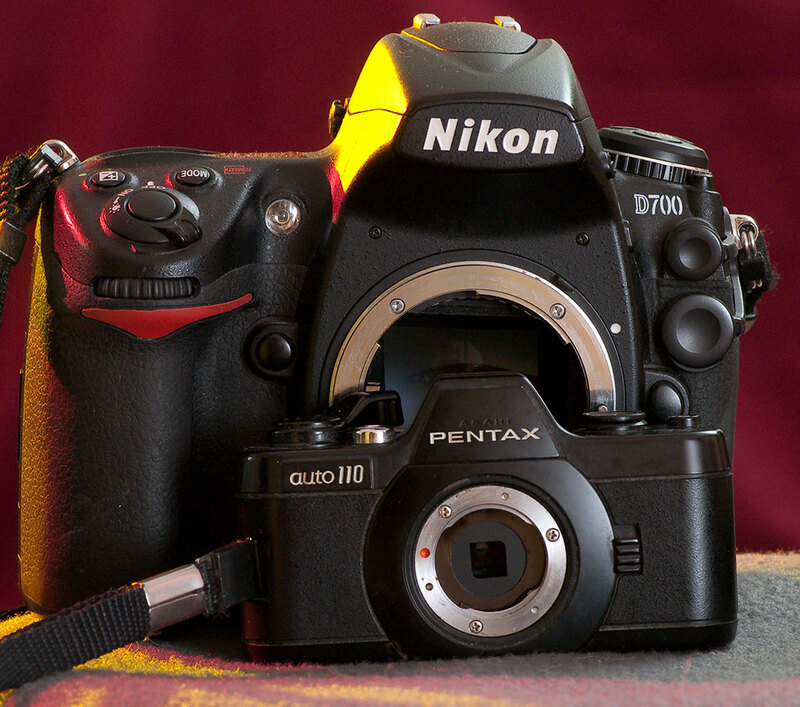 The Pentax Auto 110 sits in front of a full-sized DSLR, the Nikon D700, showing its petite size. Aww, look at you with your archive of images to go with this neat story! I should have known, thanks for featuring my treasures!